Or I Have Nothing Else to Show You But My Dad’s Cardigan and That’s Getting a Bit Dull. Note: this post originally started out as “UFO Monday”. Yeah. Life got in the way. It nearly ended up as UFO Monday again! Enjoy! P.S., Yes I know it’s Friday and my title says Thursday. It’s been a long week! I am a perpetual starter. 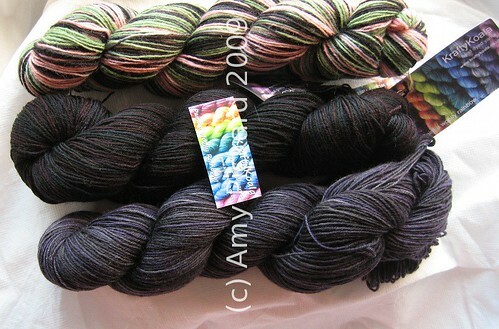 I love the rush of a new project, new discovery, new yarn and a new pattern. I knit like woman possessed for about a week and then … it … all … just ……..
As a consequence, I have some abandoned safely stored projects. I did a review of them a while back but for my own mind, I wanted a more comprehensive survey of what I have and what there is to do on them. The frustrating thing about my lack of attention to these projects is that the majority could be done in a fortnight (or even faster) if only I concentrated on them, one-at-a-time. To Do: Charts I and J. Wash seventeen times to remove the rancid oil smell and block this mo’fo’ to hades. Really looking forward to finishing this. Even if I never wear it, it’s a frickin’ work of art! Completed: Main body of shawl, and over half of edging. To Do: remainder of edging, blocking. Started this in 2005. That’s not a typo. See that crescent shape on the left-hand side of the photo? That’s all the border that I have to finish. Apparently I don’t want to wear this shawl. 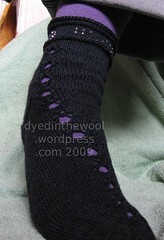 To Do: Rip out toe of first sock, extend the foot length by a couple of centimetres, knit second sock. Made the foot too small, so I put it away to think about what it had done. 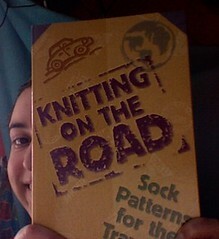 Then I nicked the needles I was using for something else. I’ll be giving these to my mum in summer. Yeah. To Do: 2nd sock – easy, right?! 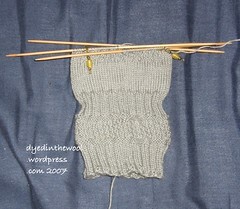 1st sock took me practically no time at all but I just haven’t got around to casting on for the second one. I suspect this will be the first project back on the needles after I’m done with my dad’s cardigan. To Do: 2 more repeats, graft ends together. Wear. Style. 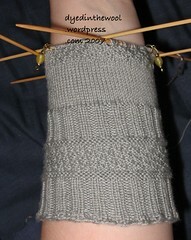 I need to concentrate on this project because of the patterning and the short rows. Should be pretty easy to finish in a day or two. Camo Convertible Mittens (were for my mum, are now for me). Too big for my mum, so I made her a pair of Fetching mittens instead. Really like the pattern and they’ll be perfect for me when I venture out into the real world! Love this pattern and the sock fits amazingly well. I need to pay attention with these socks, so the first one took me forever. Concerted effort needs to be applied for the second! To Do: 7th and final tier on smaller needles and 3 more tiers with larger needles, upper bodice modules, garter stitch edging, and fastening treatment. I stopped liking this for a while and was considering ripping it out, but I think I’ve fallen back in love with it. The squares take very little time to knit so I think setting a target of a few squares a day and it would be done in no time! So, all-in-all, not a bad number of unfinished items, but more that I would like. As soon as I’ve finished my dad’s cardigan (the fronts of which are nearly complete, by the way), I’m going to work on a design or two, so it will be the ideal opportunity to knock a couple of these on the head. Way back when (on the 6th of August), before what politicians euphemistically call “recent events” I mentioned that my mum told me she didn’t need any new socks for a while. I had great plans for clothing her feet, and her next pair was going to be an adaptation of the Tropicana socks from Magknits in Sock It Too Me Puzzle. I decided that if these were going to be the last pair of socks in a while, I’d better go all-out and go for the tried and tested – Regia Silk and Nancy Bush . The Little Child’s Sock didn’t speak to me when I saw it in Knitting Vintage Socks – I think it was the awful turquoise-coloured yarn – but I saw Stacey’s version in green and that was much more like it! 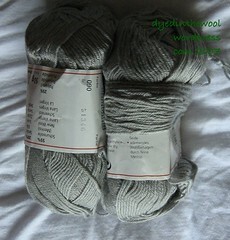 I then spotted another green pair over at Flickr and tracked them down to Mustaa villaa (Black Wool in Suomi). Progress from the 12th of August to the 17th. Modelled on my arm – much better! I composed most of this post during Wednesday morning. That evening, my dad received a phone call from “She Who Will Not Be Named” informing him that my grannie was being released from hospital the next day. Great for her. Not so good for my dad. Despite having been told by the doctor just the day before that he had laryngitis and he must rest for at least a week, my dad offered to pick her up and stay with her until the weekend. I also wanted to say thank you all for all your good wishes and thoughts for my grannie and the rest of my family. I don’t know if you believe in the power of prayer/thoughts/good vibes (there have been studies and counter-studies proving and then disproving it) but it helped me to cope, and the good news is it looks like my grannie will be able to live independently for the immediate future.